The damage might start as a drip – a leaky valve or pipe, a cracked window seal, or delaminated roof flashing. Often, the event is more sudden, like a pipe burst, natural disaster, or water damage associated with fire. Either way, water damage can be costly, inconvenient, and even dangerous. Having a water damage response strategy is critical to minimizing the magnitude of damage and cost of repairs. Terracon can help you develop a response strategy through the process outlined below. The American Industrial Hygiene Association (AIHA) recommends that building owners have a formal mold and water damage prevention program as evidence of appropriate due-diligence in protecting a building and the health of its occupants. Building owners should perform a moisture intrusion and water damage audit or inspection to document conditions. Even small signs of water damage (e.g., a musty smell, surface staining, paint bubbling, or delamination) may indicate significant hidden damage. 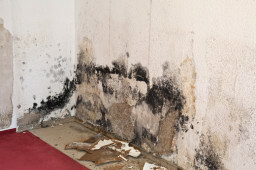 Mold growth can begin within 48 hours of water intrusion, so rapid investigation of potential water intrusion sources is vital to minimizing building damage and maintaining a high level of indoor air quality. By the time water damage is noticeable, the problem can be well established inside of a wall cavity or ceiling space. If left unchecked, the damage may grow to be extensive and costly. Terracon uses a combination of state-of-the-art technologies, including infrared thermal imaging cameras and ultra-sensitive moisture meters, that efficiently and accurately verify wet building materials. These methods provide our clients with reliable data that lead to development of proper scopes of work and more efficient drying or remediation. If microbial growth is suspected but not evident, our investigators use appropriate sampling and analysis techniques, in combination with moisture data, to determine the extent of damage and any potential effects on indoor air quality. Attempts to dry or remediate water damage can be futile if performed before the source of moisture intrusion is identified and repaired. It is important not to overlook moisture that enters a building through, or is produced by, heating, ventilating, and air-conditioning (HVAC) systems. Improperly maintained or adjusted HVAC equipment can contribute significantly to microbial growth and poor indoor air quality. Terracon has extensive experience trouble-shooting building systems, identifying leaks, and recommending engineering solutions that can minimize the sustained impact of water intrusion events. Remove damaged materials so that the building can be safely returned to its previous use. If mold is present and contaminated materials need to be removed or cleaned, Terracon conducts remediation planning and design, project management, monitoring, and post clean-up sampling to confirm that contaminated materials have been removed properly. Removing water-damaged materials often involves disturbing suspect asbestos-containing materials like gypsum wallboard, joint-compound, textured ceiling materials, sprayed-on fireproofing, and thermal system insulation. Compliance with state and federal regulations requires that these materials be identified and sampled before being disturbed. In addition to mold and other microbial sampling, Terracon also performs asbestos and lead-based paint testing, abatement project planning and monitoring, and final clearance testing. Mold is not the only source of indoor air quality (IAQ) problems. Inadequate ventilation in combination with indoor chemical use, cleaning products, furnishings, building materials, and outdoor pollutants can also adversely impact IAQ. Terracon identifies the source of these problems using a variety of strategies that include employee IAQ questionnaires, measurement of temperature and humidity, air sampling, HVAC testing, and potential air contaminant source analysis. Establishing a relationship with a responsive, resourceful, and reliable “on-call” industrial hygiene consultant like Terracon is a critical step toward addressing water intrusion problems immediately. A modest initial investment can save thousands of dollars in the long run. Terracon has more than 45 years of experience assisting clients with mold, IAQ, and other environmental concerns. Terracon has 22 Certified Industrial Hygienists and 40 industrial hygiene practitioners throughout the United States that investigate occupational health and safety hazards, while offering solutions that safeguard the workplace, improve employee morale and productivity, and protect investments. If you are interested in developing a water damage response strategy, preparing a Mold/Moisture operations and maintenance plan, or making Terracon your “on-call” industrial hygiene consultant, contact one of our IAQ team leaders listed below. Crandall has certifications in industrial hygiene and the specialty area of indoor environmental quality by the American Board of Industrial Hygiene. Crandall specializes in investigating buildings for moisture intrusion and microbial contamination, and provides litigation support in these areas. He has written specifications and conducted oversight for hundreds of microbial remediation projects. Garrison is the department manager of IAQ Services in the Terracon Dallas, Texas office, and serves as the primary investigator in commercial building investigations. He is a Certified Spore Analyst and serves as the laboratory director for the Texas-licensed Dallas Mycology Laboratory. Garrison has focused his work and research on the role of fungi in indoor environments. His research has been published in medical and environmental journals, and was integral in the development of a U. S. patented bio aerosol sample device.